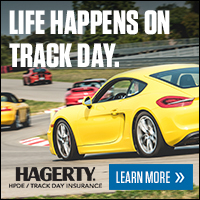 Safety is our primary concern; your safety and the safety of those with whom you will share the track. Please note that anyone driving in an unsafe manner in Tracks Unlimited’s sole discretion will be expelled from the event without refund. Hopefully through the instruction provided, you will expand your capabilities to match those of your car. No racing is allowed. This is not a racing event. This is a high performance driving event with instruction. There are no cash prizes, trophies or awards. For all driving groups you must wear a helmet certified with the SA2005 class [or better]. Any other helmet will not be approved, and you will not be allowed on track. Helmets will be checked at tech inspection before your car is allowed on track. See the tech inspection form to know what will be inspected. For the novice and intermediate driving groups, convertibles are permitted with the factory installed roll over protection. For the advanced driving groups, convertibles must have a roll bar that passes the broomstick test in order to participate, or they must have a hardtop installed securely. Passing Rules are defined by run group. Novice/beginner drivers may only pass when a passing signal or “point by” is received from the car being overtaken, and passes may only occur on designated straights. A “point by” is accomplished by the driver extending the left arm out the drivers side window, and pointing toward the passing side. The passing side will be determined at the track. Passing for Intermediate drivers is similar in that a point by is required, on the passing side, however passing may occur anywhere on track that the driver desiring to pass and feels confident enough to accomplish the pass. Passing for Advanced drivers requires a point by, but passing is unlimited to either side of the vehicle being passed, and can be done anywhere on track. Race Groups/Test&Tune drivers will have open passing without a point by. Regarding passing, the slower car should stay on line, and “lift” off of the throttle to allow the faster car to get by. This is just common courtesy. If you find yourself doing this alot, after a few sessions, you will find others having to give you the point by. Blocking is not permitted. If a car is faster than you, let them by. Your time on track will be more enjoyable, and so will theirs. You must watch your mirrors. Give the point by to the car behind you as you enter a designated passing zone. Don’t wait till the middle or end of the passing zone to give a point by. It is too late at that point. Only enter the “Hot Pit” designated area when you are completely ready to go on track. Your car should be ready, your belts or harnesses fastened, helmet on and fastened and windows down. You will need to show the attendant your wristband designating your run group to get into Hot Pit before the start of your run group session. Enter the track only when the designated starter has motioned you to go on track. Accelerate quickly to get up to speed, but check your mirrors carefully before blending on line. Run the first lap of each session at a reduced speed to allow you to get used to the track and speed, and to allow your tires to warm up. Be sure you identify each corner station on track. They are your eyes ahead as to what is happening on the track. Study the flags and know what they mean before you arrive at the track. You will be notified that the session is over with the checkered flag. Complete the balance of the lap but slow down to allow your engine and brakes to cool before entering the pit area. When exiting the track, the driver should raise the left arm out the window and up, with a closed fist. This is the signal that you are entering the pits. Use this anytime you are leaving the track, regardless of whether or not the session is over. Tracks Unlimited wants to expose as many as possible to the excitement of being in a car on a real race track. Therefore passengers will be allowed to ride with drivers in the Advanced group and with instructors only. If a car is determined by a Tracks Unlimited worker to be operating in an unsafe manner, passenger privileges will be terminated, and possible expulsion from the event may occur. There will be a drivers meeting at the beginning of each day. See your event info sheets to find the time. All drivers and workers must attend. If you miss the drivers meeting, you may not get to drive. For your safety, all drivers must wear at a minimum a long sleeve cotton shirt and long cotton pants. Closed toed shoes are also a requirement. While cotton offers limited protection in the event of a fire, we recommend a fire rated or flame retardant suit. Your side windows must be down at all times while on track. This is true even in inclement weather. If you go off track, (an Off), several things must happen. If you only drop two wheels off the track, and don’t sense anything wrong with your car, you may continue in your session. If you go 4 wheels off, you must come in the pits at your first opportunity, and let a worker quickly inspect your car for safety purposes. The worker will also want to briefly ask you a few questions to make sure you are ready to go back on track, and know what you did and how to avoid doing it again. If you have a second 4 wheel off, you will forfeit the rest of that session. If you have a third 4 wheel off, you are done for the day. Remember, this is not about racing, this is about learning how to drive your incredible car very quickly around the track in a safe manner.